Steiner Electric employees and its customers once again stepped up—in a big way—to help Rockford-area children-in-need by collecting warm clothing. 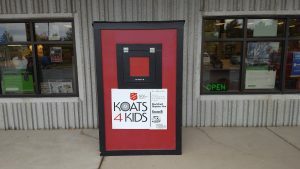 This was the 16th year that Steiner Electric had partnered with the Salvation Army for its annual Koats4Kids drive. In addition to collecting the items at Steiner Electric facilities, the company played a major role in the area-wide effort. “As we have for years, Steiner was a big contributor to the drive, providing transportation and delivery of collection barrels and huts,” says Jeff Nagel, Steiner Electric’s Rockford inventory control manager. Steiner volunteer crews transported the collection huts and barrels to-and-from 35 area donation sites. The huts were built primarily by Steiner traffic supervisor Gene Bullock. If you’d still like to contribute, it is never too late to help. You can donate directly to the Salvation Army via its donation page by clicking here.